This is the first time I have felt to share with you something from this trip to India. Terry, Sasha and Satyapriti have joined me on what may be an annual pilgrimage to this land of saints and seers. This was my home for six years and in some ways will always be my spiritual home. But it has taken me a long time to adjust to India’s energy this trip. I feel this is because its been a long time since I’ve been here last and Mother India had to take more time to clean out the Western influence: it is very different here on many levels. The most striking thing about India is its energy. It has to be experienced to know how different it is from what we have spent our lives living in. Like a fish doesn’t know anything about the water it swims in until it is taken out, so too we can not know how much we are influenced by the energetic field we live in until we get out of it. In the West the energy is very different. It is rajasic and mental. We tend to live more in the abstract, through our mind and intellect. We live life vicariously through objects and symbols, and prefer it that way. Our books and movies, our TV’s, computers and the Internet…have so completely distracted us and absorbed our attention we don’t see we are actually not living life but are living a mental reflection of it. This has isolated us from our intuition, our feelings and our capacity to experience life as it is in present time. We are desensitized and abstracted; we have lost touch with the existential reality, we are often too busy or preoccupied to notice. Have you ever noticed how we appreciate a place better by looking at the pictures we took afterwards than while we were there. This is the energy field we live it. It influences us without our realizing it. Here in India life is simple and direct. As a consequence people here live more in the present, with life as it is. In part it is necessity that requires this, doing what is required with little ado. Sri Atmananda’s Ashram we are staying at is in rural, southern India (Tamil Nadu). People are poor and have to work hard to survive. But they don’t seem distressed. They have accepted their life as it is and appear much happier than us Westerners. I have been watching an old farmer over the last ten days or so plow his rice fields with two bulls and a crude plow day after day. He’s there every morning as I walk back to my room after morning meditation in the Ashram. The sun is just rising, and there he is plowing his fields. Some days he smiles others he ignores me. Two days ago about 8 or 9 village women began to plant the rice shoots. Gossiping as they work, laughing or quiet, bent over in half as they spend the whole day seeding the freshly plowed rice paddies. The sky is vast and filled with multicolored displays of pink, powder blue, with streaks of yellow and red as the sun plays off the clouds. It has been raining off and on these days, cool and humid with a light breeze. I find myself naturally moving into sync with their consciousness. I can see how much more people here are connected to the physical realities; they do not live as much in abstractions like we do. In this way they are simpler than us. Their mind is not as dominant as it is for us. They are more intuitive and seem to be naturally aware of their connection with the earth, nature and each other. They know they are part of a whole, a community, an extended family. There is a simple natural faith in them because of this. I find that the vital and psychic aspects of life are more to the front here in India. There is a down side of course. Because the mind and intellect is not as developed they are also more superstitious, more conditioned by their tradition, more inclined to accept the cultural norm. They are less analytical, more intuitive, less creative, more practical, but also more inclined to accept their lot in life, free of the anxieties we suffer from. Although poor there is not a sense of lack, they seem content as if there is enough, no matter how meager it may seem to an outsider. The psychic and intuitive have freer room to play and thus the religious teachings here in India are more mythical, intuitive and devotional compared to ours in the West which tend to be more analytical, abstract and intellectual. This is why Buddhism is so successful in the West as it puts more focus on awareness and knowledge, rather than devotion. I can see that most of us are a mix of both of these tendencies, one to devotion and experience and the other to knowledge and awareness. But for most of us from the West we have too little spiritual experience or inclination to devotion. Yet devotion and knowledge each are ‘more’ by the integration of the other. This is why I’m feeling to bring people here to India with me. I am watching what is happening to Terry, Satyapriti and Sasha and I can see Mother India working Her magic on them. 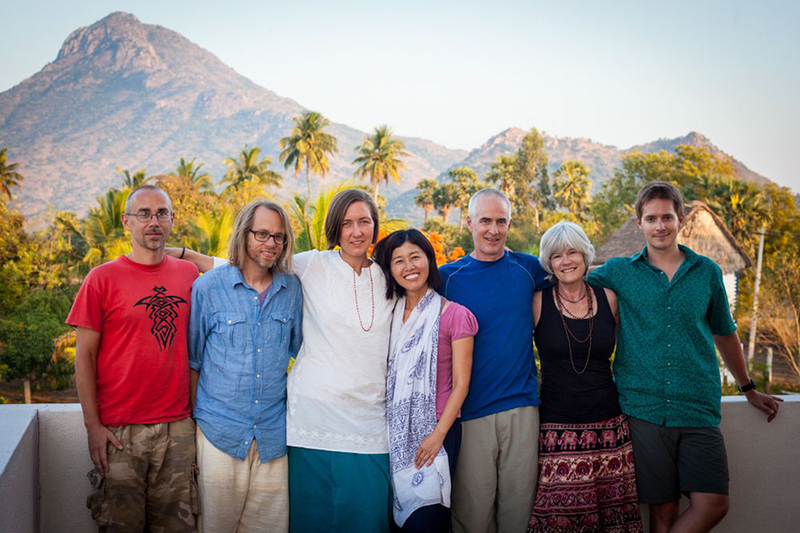 Clearly coming to India is allowing a fuller, integrated spiritual development. In India spirituality is part of their culture. Their spiritual tradition is not as rigid, dogmatic and hierarchical as in the West. Religion and spirituality are much closer. They honor and respect the spiritual wisdom of their scriptures while emphasizing surrender and service to the guru and spiritual masters as the actual path to the goal. The guru, the spiritual master and teacher they feel are manifestations of God. They gain their knowledge directly from their mouths as well as the scriptures. They put their devotion into action by providing service and contributing generously to them and their temples, ashrams and institutions. Any true spiritual seeker can find not only knowledge and wisdom here in India but food and shelter as well. On the other hand spirituality in the West is seen as separate from religion. Religion in the West is more mental, dogmatic, judgmental and hierarchical. Spirituality in the West on the other hand is a relatively new phenomena, it is seen as outside of the cultural norm and thus suspect. Of course it doesn’t help that many new spiritual teachers seem to be in it for fun and profit by following the cultural norm by advertising and charging exorbitant fees. Unfortunately we don’t have a spiritual tradition yet here in the West, so this is often the only way they have of getting out their message. India is magical. We all walked around a local mountain that stands up boldly from the planes here for an annual spiritual festival called ‘Deepan’ (the lighting of the lamp), with hundreds of thousands of people. They come from all over India to celebrate the manifestation of the Hindu god, Shiva as this mountain, Arunachula. The perimeter road is jammed with a river of humanity walking around the mountain in honor of this event. There is something so powerful to be part of something with such spiritual import with thousands of others. In the West we have our football and baseball games, but here in India they have their religious festivals. It took us four hours to walk the approximately eight miles. We saw a huge flame lit at the top of mountain at dusk and were thrilled as the whole crowd celebrated the moment. It was a full moon, cool, a perfect night…a rare event over which we will not quickly recover. I came to India this time not for my self but to support those sincere seekers who have come with me on their spiritual journey. I can now see that most people I work with would benefit by coming here. It is clear that by experiencing the difference between the United States and India you can gain a greater appreciation of both. I plan to explore coming here every year or every other year for an extended spiritual retreat (one or two months) for those who can join me for all or part of the time and experience this for themselves. I’ve been to India 3 times to visit my Guruji and felt for the first time in my life I was Home! India is where Spirituality started and it has been charged by many Beings. Its atmosphere is like an ashram.I totally agree with you on the difference it has from the West!